1,001 opportunities to practice for the Series 7 Exam This comprehensive study guide takes you beyond the instruction offered in Series 7 Exam For Dummies, by giving you more practice and review of the major concepts covered in the exam. 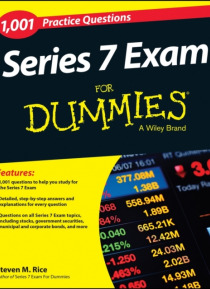 If you're prepping to take this intense six-hour exam, 1,001 Series 7 Exam Practice Questions For Dummies covers stocks, municipal and corporate bonds, and option… s plus rules for acquiring customers and handling accounts and everything else you can expect to encounter on exam day! This books gives you 1,001 practice opportunities to prepare for the Series 7 Exam, each question explained by providing a detailed, step-by-step solution. If you're an aspiring financial professional, you'll find all the practice and helpful guidance you need to succeed!